Whale watching season is upon us. Myself and the kids saw some whales heading north in July when we were in Jervis Bay. We hope we will see some heading south again soon. There are many places to watch whales from within Sydney itself, check out the list on the National Parks and Wildlife website Wild About Whales. Wild About Whales has sent me this cool infographic with info about the annual Whale Migration, lots of interesting info there. Lisa Edwards has written an amusing account of whale watching at Cape Solander, read it on her blog Raising Explorers here. 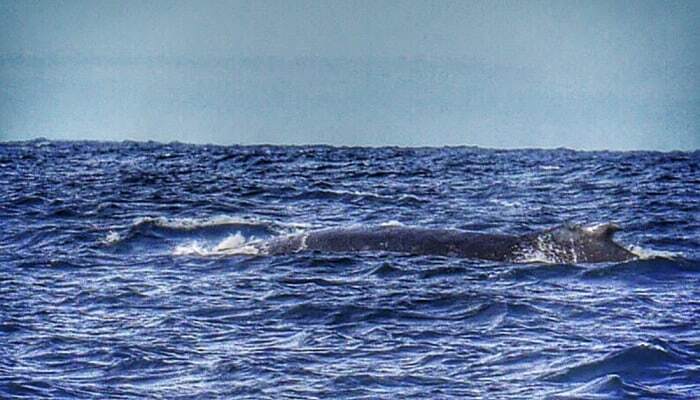 Our whale photos were part of a post about Things To Do In Winter At Jervis Bay. We once went down to South Curl Curl beach for a swim and almost collapsed when we saw a mother and baby whale frolicking right there, just off the beach by the rock pool – what an amazing experience. I saw one in July in the harbour by Manly Wharf as well, when walking the Spit to Manly Scenic Walk. And who remembers, about 13 years ago there were two whales playing in the harbour for a whole day? Of course, the coolest place in Sydney to see whales migrating – north or south – would have to be at Whale Beach itself! Have you seen a whale passing by this fine city or state of ours? Or past some other place in Australia? Out at sea or close to shore? I’ve never seen a whale in the wild infortunately. We do have one that visits the coastline off Townsville every year called Migaloo. It’s a white whale I think. I would dearly love to see one! I think I’ve heard about that white whale… you’ll have to keep your eyes peeled… or maybe the whales prefer to go around the outside of the Great Barrier Reef. Thanks for popping over Pinky P.
I love that infographic. I’ll have to print it out for Master J. We saw a Southern right in labour at Warriewood beach earlier this year. I was amazing, I felt so privileged to be watching her. How amazing Robyn… do you remember the fantastic photo of the whale taken underwater at Freshwater earlier this year ? Fantastic shot, and we’d been at Freshie that morning but before or after the whale- bad timing! Thanks for the mention, Seana. Whale watching is awesome. I love that infographic, too. Very handy info (& inforgraphic!) Thank you!